Before we go into African American History Month, I thought I’d throw you all a mind-bender: Are Process and Creation the same thing? Is this a sort of “chicken-and-the-egg” thing? 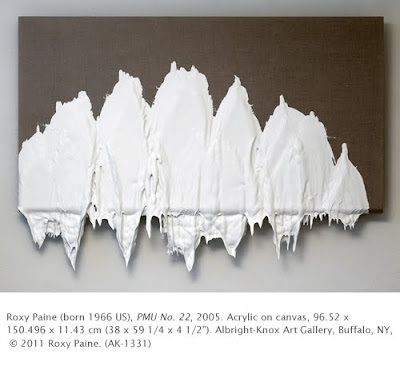 Looking at the work of Roxy Paine is an exciting trip down the philosophical highway, and it is especially refreshing in the 21st century, a time when we tend to glaze over and think “oh, everything’s been done.” Well, I may look at my own paintings and think that, but it is just not true. There are so many artists out there blazing new territory and I aim to point them out to you. “Process” has been a focus for certain artists in western art since the nineteenth century. For the Impressionists, translating the visual perception of light on local color was all important. Many art historians consider the focus on light and atmosphere on color to negate Impressionist subject matter. For the Surrealists, the most vital aspect of creation was the subconscious, or dream state. Thus, we had the first instance where process trumped creation. For the Abstract Expressionists, process was all important compared to the finished product. In Minimalism, the extinction of brushstroke or narrative content reduced the artist’s subjective input to practically nil. What is fascinating about the work of Roxy Paine is that he creates copies of complex forms from nature (plants, trees), and he has also pioneered computer programed painting and sculpting machines. His giant cast trees with prominent welding focus the viewer’s attention on the growth and decay cycle of trees, and also the eternal cycle of creation. His computer-programmed “Erosion Machine” is set to erode a piece of sandstone. While the computer has been given certain parameters, the make up of the stone ultimately decides the outcome of the finished piece. Paine’s Painting Manufacturing Unit (PMU) is programmed to emit bursts of paint at controlled intervals. The randomness of the control program ensures that the effect is, ironically, spontaneous. 1) What constitutes art? 2) How should the artist focus energy: on process or on resultant image? 3) Can you think of any artist who does both? View Paine’s arboreal splendor, Maelstrom (ironically at a museum that once shunned modernism). Correlations to Davis programs: Explorations in Art Grade 4: 6.23, 6.35; A Community Connection: 9.2; Discovering Art History: 17.2.